Sundancer Jewelry Company is located in the heart of the Southwest in Albuquerque, New Mexico. We have been in the jewelry business since 1973, specializing primarily in a large Southwestern-style line. All of Sundancer’s jewelry is manufactured in-house, thus enabling us to insure that meticulous attention is given to each exquisite detail. Such in-house production also allows us the flexibility to tailor certain products to your needs when purchased in a given quantity, so we welcome your inquiry about items not pictured in our catalog. With every purchase from Sundancer Jewelry comes a promise of “satisfaction guaranteed,” a phrase we take very seriously. We value you as a customer, and your feedback is not only welcome but encouraged. 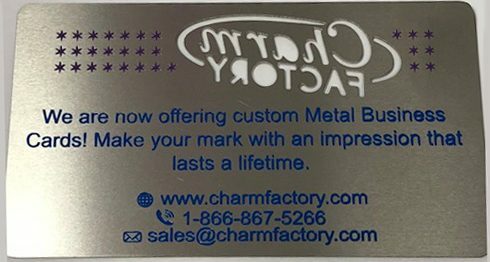 Imagine what it would be like if you could easily add your name, signature, or logo to a personalized metal business card. 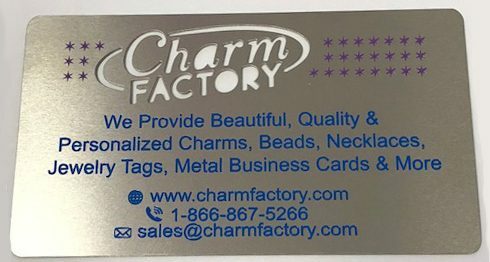 Metal business cards add a special touch to brand your business with an impression that lasts a lifetime! Tired of wasting paper business cards? Here is a great alternative that will last a lifetime! Metal business cards can set your brand apart from other competitors.